As a jewelry designer, I really enjoy manufacturing engagement rings. Blake Lively’s engagement ring is a ring that comes across my desk all the time. I always tell my customers if they want an engagement ring exactly like Blake Lively’s engagement ring, they should get it from the designer who designed her ring. But, I am always willing to use a ring as inspiration and make it even better than the original design. I have realized that clients today really know what they want and I make sure I can design the ring and manufacture the piece. I always give my clients my professional opinion. If I feel the custom design aspects in a ring is not pretty I always tell them. The picture above is inspired by Blake Lively’s engagement ring. As you can see in the picture, this particular ring has a cushion cut center stone. However, it can be manufactured for any shape or size center stone. This particular ring was designed with diamonds going up the legs of the ring and on the basket. I wanted to make this ring with as little metal showing as possible. I know Blake Lively’s engagement ring doesn’t have a halo but, halo engagement rings are very popular and I thought it would be nice to design a shank (ring portion) like Blake Lively’s ring and add a halo. 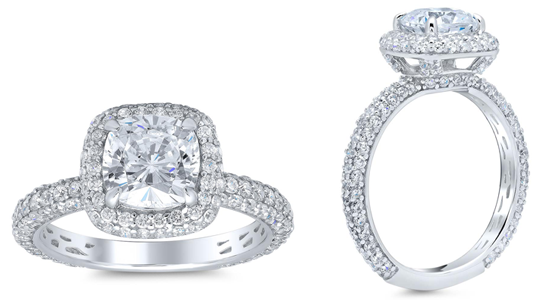 This particular halo is not your regular single halo engagement ring. This halo has a beautiful two row curve. The curve on the halo compliments the shank in my opinion. As you can see, we can design anything your heart desires. I can make your dreams into a reality. If you would like a custom engagement ring quote please request one by filling our our custom ring request form. 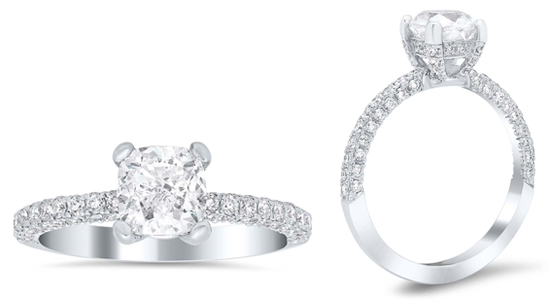 I will be more than happy to help you design the most beautiful custom Blake Lively inspired engagement ring.